“Minimally processed food a health goal” is the title of today’s Food Matters column in the San Francisco Chronicle. Q: I may be preaching to the choir here, but isn’t eating a variety of unprocessed (or at least minimally processed) foods the best way to make sure your diet is healthy? A: Indeed it is, and processing is the healthful food movement’s new frontier. Processed is code for “junk” foods – foods of minimal nutritional value. These crowd the center aisles of supermarkets, add loads of unneeded calories, rely on added nutrients for health benefits, last forever on the shelves and generate enormous profits for their makers. Sodas are the obvious examples. They have no nutrients (unless fortified), and all their calories come from added sugars. The food industry will insist that practically everything you eat is processed in some way. Unprocessed foods are rare exceptions – fruits direct from the tree or vine, vegetables pulled from the ground, nuts from wherever they come from, and raw meat, fish, eggs or milk. Everything else is at least minimally processed – washed, aged, dried, frozen, canned, pasteurized or cooked. But these cause little, if any, loss of nutritional value and make some nutrients more available to the body. In contrast, more extreme processing changes foods. It reduces the nutritional value of basic food ingredients, adds calories from fats and sugars, and disguises losses in taste and texture with additives such as salt, colors, flavors and other chemicals. Manufacturers add vitamins, minerals, antioxidants, omega-3s and probiotics expressly to make health claims. Manufacturers say they make the products to give you what you demand: cheap, easy-to-eat-anywhere foods that require no preparation and give you the tastes you love. They back these contentions with increasingly far-fetched health claims, billions of advertising dollars and lobbyists galore. The big issue is “ultra-processing,” says Carlos Monteiro of the University of São Paulo in Brazil. Writing in the November issue of the online Journal of the World Public Health Nutrition Association, Monteiro ranks the effects of food processing on health as the most important issue in public health nutrition today. Ultra-processed foods, he says, are the primary cause of the rapid rise in obesity and associated diseases throughout the world. He charges the food industry with creating durable, convenient, attractive, ready-to-eat or ready-to-heat products that are so palatable that they are habit-forming. And they are meant to be eaten everywhere – in fast-food places, on the street and while watching television, working or driving. Ultra-processed foods are much higher in calories for their nutrients than unprocessed and minimally processed foods. They have loads of fat, sugars and salt, but are low in vitamins, minerals and fiber. They are often cheaper than relatively unprocessed foods, especially when sold in supersize portions at discounted prices. And they are often the only foods available in convenience stores or vending machines. He notes that virtually unregulated advertising identifies ultra-processed foods and drinks as necessary – and, when nutrients are added, as essential – to modern lifestyles and health. Overall, Monteiro says, their high palatability, along with aggressive and sophisticated marketing, undermine the normal processes of appetite control and cause adults and children to overeat. This is just another way of saying what former Food and Drug Administration head David Kessler says in his provocative book, “The End of Overeating.” Kessler argues that processed and fast foods high in fat, sugars and salt have turned us into a nation of “conditioned overeaters” unable to recognize hunger or satiety. Current policies ensure that ultra-processed foods stay cheap, and it’s no accident that the relative cost of fruits and vegetables has gone up by 40 percent since the 1980s, while the relative price of sodas and fast food has declined. If you can afford it, choosing relatively unprocessed foods is good advice. As I wrote in “What to Eat,” it’s best to stick to the real foods around the supermarket perimeter. My only slightly facetious shopping rules: Avoid processed foods with more than five ingredients, ingredients you can’t pronounce, and those with cartoons on the package aimed at marketing to kids. 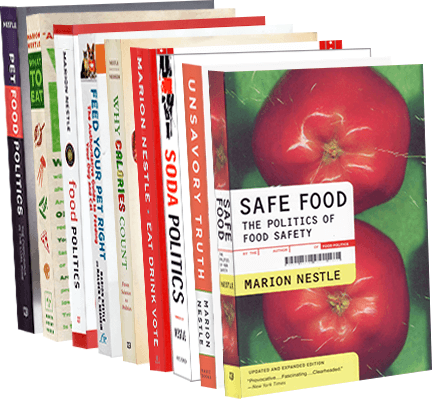 Marion Nestle is the author of “Food Politics,” “Safe Food,” “What to Eat” and “Pet Food Politics,” and is a professor in the nutrition, food studies and public health department at New York University. E-mail her at food@sfchronicle.com, and read her previous columns at sfgate.com/food.